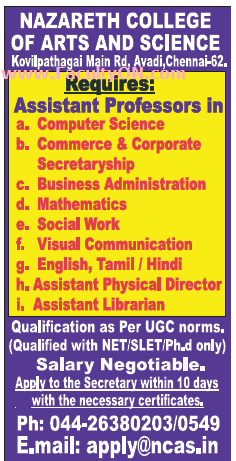 Nazareth College of Arts & Science, Chennai has advertised in THE HINDU newspaper for recruitment of Assistant Professor Plus Non-Faculty jobs vacancies. Interested and eligible job aspirants are requested to apply within 10 days from 12th August 2018. Check out further more details below. About College: Located in the suburbs of Chennai, just 15 minutes from Avadi, which houses India's only Army tank factory and depot, Nazareth College of Arts and Science is uniquely positioned to contribute to, and draw from, the strength and diversity of this sublime metropolis. Online mba depends upon your circumstances like if you are a professional you don't have any other option or if you don't have budget to pursue regular MBA. How much experience is required to apply for this position? I am doing my PHd through distance education mode, can I still apply for this position.